As a prerequisite for today’s topic, be sure to read the development team’s reminder about the nature of the people. Mainly this passage in particular: “In Mega Man’s case, his body has been almost entirely exchanged for the sake of carrying out full-scale digs in the ruins.” With that in mind, this stuff about building bodies and limb swapping makes a good deal more sense. Rock can get a tune-up using the Support Car! 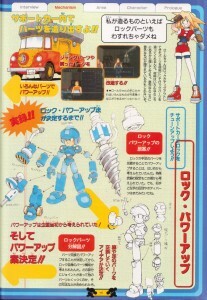 Roll: Speaking of my inventions, you can’t forget about the Rock parts! Inside the Support Car is where parts are manufactured! Junk parts and purchased parts can all be reconfigured!! Roll can use parts Rock finds on his digouts to be components for new Rock parts. These materials can be found in all sorts of unexpected places as well. You never know what kind of surprising uses you can find concealed in an unlikely item! With Roll’s skilled handiwork, all sorts of things are given complete makeovers!! It’s always exciting seeing what she comes up!! These various parts are used to power up!! How The Method Behind Rock’s Power Ups Was Decided!! Here’s how the power ups were conceived of at first!! Rock Power Ups, The First Draft!! 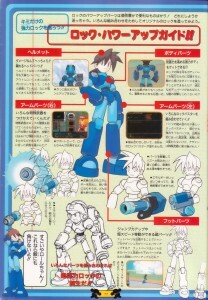 From the very start, the plan was for Rock to have interchangeable limbs to allow for power ups. We were also considering the same method for special weapons at that time. However, the distinction between left and right arm parts, and the inclusion of body parts were still to come. The decision was made to go with the exchangeable arm and leg parts idea!! A Diagram of the Rock Parts Broken Down!! Once the system for power ups via parts swapping was settled, we started thinking about how Rock’s own parts were comprised. By figuring out how his joints were configured and where other parts would be ideally attached, the power up methods came to be determined. And so at last, the Power Up system was decided!! Create your own Powerful Rock!! Rock’s power up parts are quite handy and customizable! How to best use these parts together is up to you. Be sure to try out many combinations to create your own original Rock! Damage is no problem with this!! The trusty head parts!! The helmet is a very important piece of equipment for protecting Rock’s cranium. Whenever you go out on a dig, one should never forget to wear a helmet! With this gear on, you should be able to walk away from even the most dangerous spills!! Look good and stay cool under pressure with this! You can even get a sturdier body to boost your defensive power!? The body parts that protect Rock’s body can be exchanged for even more powerful protection, reducing the damage taken from the enemy even further!! With a strong, solid set of body parts equipped, there’ll be nothing to fear from the enemy’s attacks!! Stay composed no matter what enemy comes your way. Very reassuring on any adventure! A Rock Buster with numerous combinations!! The Rock Buster uses parts that can come in many gratifying combinations! These powerful parts were designed to start you off with from the very beginning. The appearance of the buster doesn’t change with the different parts equipped, so that its design contrasts with those of the special weapons. By experimenting with the combinations, you can create your own optimal Rock Buster. So many different special weapons to try on!! Special weapons will come in handy a lot over the course of Rock’s adventure. There are weapons for tearing down walls and ones that boost your attack power, but these all have limited ammunition so it’s important to keep an eye on your weapon gauge! Always try to select the best weapon for a given situation!! Roll can change out your special weapons in the Support Car! With these parts equipped, you’ve got something like a bazooka canon! You can clear out enemies from long range with its powerful shot. It’s also possible to fire a continuous blast packed full of powerful energy. The front of this weapon can emit a blade of energy. Use it to hack and slice your enemies! This energy shield should defend against enemy attacks. Up your jumping power or gain super-speed with these incredible mobility parts!! Swapping out foot parts can increase jumping or dashing abilities to new heights!! Separate parts can be attached simultaneously to the areas around the calf and below the ankle to allow for multiple power ups!! There’s even parts that work like roller skates! Yeah!! By combining these different parts together, you’ll form your own ultra-powerful Rock!! Rock: These are great, Roll! Now no matter what I’m up against, there’s no way I can lose!! Rock totally reminds me of the action figures of my youth which sported interchangeable parts that snapped on and off. That was also the idea behind Mega Man Universe‘s character creation as well. You know, the old Mega Man toys did that, too! Starting with the concept of taking an enemy’s weapon, I guess you could say part swapping itself is a very Mega Man concept. I like the look of the cords and cables protruding from the old special weapon designs, but for the sake of durability it is probably better that those things are kept internally. I remember how strange I found those diagrams of Rock’s limb construction to be at first. What happened to his flesh and bones? But with what I’ve come to learn over time about the carbons being essentially robots made of meat who can mechanize themselves with relative ease, I find myself liking this inspiring design concept more and more. One important question still remains, though. What happens to the parts that aren’t in use? That’s one subject the developers probably aren’t too keen on expanding! Now that you’re armed with an enhanced understanding of his design, and if you haven’t already, get over there and vote for Rock’s latest armor! Be sure to check out some of the fan-made designs, too! May the best Volnutt win! 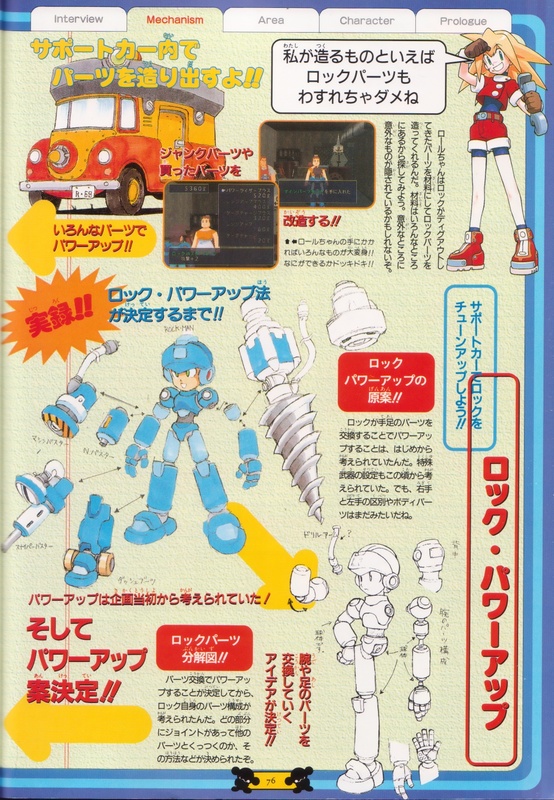 8 Comments to "Building a Mega Man"
That’s fantastic! I love Niklas’ style. Volnutt appeared without his armor in the opening of Legends 2, and he looked completely human (or Carbon). I’m not opposed to Carbons having the ability to mechanize themselves (the theme was also carried over to the ZX series), but I don’t understand how Volnutt can still appear human if his body was largely swapped by mechanical parts. Does he have parts that look organic, or is he able to transform his body with the same nanotechnology Yuna and Sera are made of? Though Volnutt was able to revert to the form of a baby, I find the second option unlikely since Rock blended with the Carbons to a point no one can tell the difference. Nah, he probably doesn’t do that. I bet they have some way of preserving their normal bodies, but you’d have to wonder how these things grow and age with the rest of the body in addition to being kept alive for such extended period. Unless they are just camouflaged prosthetics! And how nanotech would come into play… So many questions, so few direct answers, but plenty to think about. ZX creates a great transition to Legends, I think. The advancements in technology that brings humanity and machines closer and closer can go far in explaining how beings like the carbons were forged. Even though the particulars of that aren’t explained too clearly either, just knowing such factors are in play in the story makes a world of difference. It was way more difficult to picture a lot of this stuff before ZX came around! That’s another series I hope gets continued soon. Oakie: At this point, I’m assuming he just swaps his head to different bodies. Characters like Teisel and Glyde and Bola, etc. sure make it seem like the heavy armor bodies are normal for serious diggers. With the obvious exception of Tuttle, since it takes some real guts and style to walk into a dig wearing that attire. Head swapping… Are you thinking of the same manga I’m thinking of? I’ll have to put that on here sometime. Switching heads sounds pretty reasonable to me actually. Ina sot of Mr. Freeze sort of way.